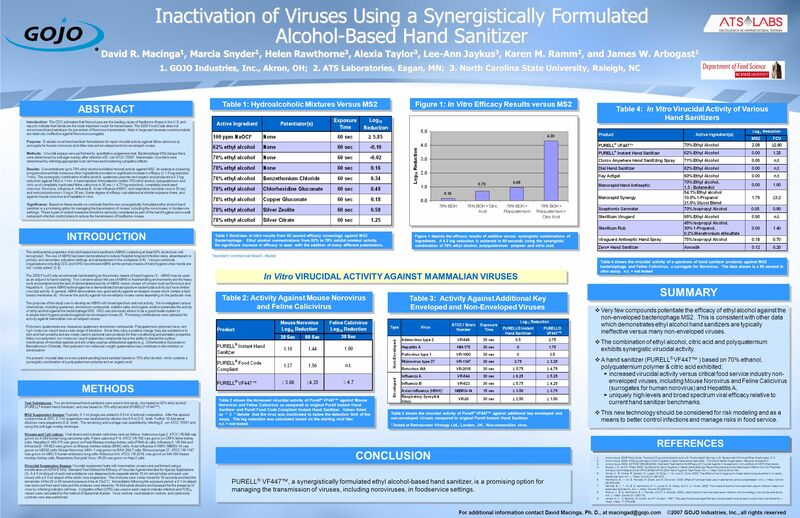 Inactivation of Viruses Using a Synergistically Formulated Alcohol-Based Hand Sanitizer David R. Macinga 1, Marcia Snyder 1, Helen Rawthorne 3, Alexia. Download ppt "Inactivation of Viruses Using a Synergistically Formulated Alcohol-Based Hand Sanitizer David R. Macinga 1, Marcia Snyder 1, Helen Rawthorne 3, Alexia." Meeting need and improving coverage workshop. Meeting need: calculating and improving coverage. Employers are beginning to recognize that offering effective health promotion programs can help to improve their employees overall health and well-being. Development of a Panel for Dengue Virus Maria Rios, PhD CBER/FDA Blood Products Advisory Committee Meeting December 14, 2010. Experiment five Isolation and Identification of influenza virus. Hazards in The Workplace and Measures to Overcome Them Idham Hafize Supi Fatimah Che Rahimi. In the name of God. Summer School Influenza Unit, Pasteur Institute of Iran summer 2012. Efficacy of Cotton Sheets as a Barrier Against Bacterial Transmission in Hospital Environments Nikol Ann Rainwater and Carolyn Mathur, Ph.D. Department. Terry Keep September 18, 2013 ADVANCES IN UV TECHNOLOGY FOR 4-LOG VIRUS DISINFECTION OF GROUNDWATER. Infection control Antiseptics and disinfectants Antiseptics and disinfectants. HAND HYGIENE PRESENTER: CATHERINE W NGUGI 1. Objectives n Identify the single most effective way to reduce the spread of hospital associated infections.